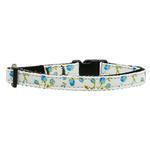 Your cat will look adorable and ready to play in the garden in this Roses Nylon Safety Cat Collar in Blue! Very prompt delivery and great packaging. Will continue to purchase from them.